DnBuster's Place: Purex Ultra Packs Liquid Laundry Detergent~ Review! UPDATED! Purex Ultra Packs Liquid Laundry Detergent~ Review! UPDATED! I am a member of the Purex Insiders. items before they hit the store shelves! I just cant tell you how much I luv this group! Now Purex is taking laundry to a whole NEW level! This time around, I was sent a FULL SIZE bag of the NEW Purex UltraPacks Liquid Laundry Detergent! All I can say is WOW! What took so long for Purex to come up with these. These past few months, due to the complete remodeling of our home do to a MAJOR water leak and then a fire, I have had to carry all of our laundry to the laundry mat to wash them and then carry them all back home. The biggest bummer about having to go to the laundry mat is lugging that big bottle of detergent all the way up there and back for just a few loads! These little packets are so great! There is no mess from having to measure the detergent, no spills all over the washer from the dripping and no heavy jugs! I carry 1 packet for every load that I need to wash. I just throw them in the washer add the laundry and walk away, they dissolve in the wash! That leaves me nothing to tote home except my clean, fresh smelling clothes! I give these NEW Purex UltraPacks a 5 out of 5! Thanks Purex for and AWESOME new product! 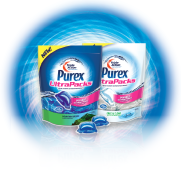 What are Purex Ultra Packs? Each Purex UltraPack contains powerful 2x concentrated liquid detergent, giving each UltraPack double the cleaning power in every drop. If you have a front loader, make sure to put the pack directly into the drum, not the drawer. The NEW Purex UltraPacks liquid laundry detergent will hit store shelves in mid February 2012. At that time you can request a sample of Purex UltraPacks and prove to your self that they are the greatest invention in laundry! Get a FREE SAMPLE HERE. disclosure~ I received a full size package of Triple Action Purex UltraPacks liquid laundry detergent (18 pack) from Purex for my review. All opinions expressed are my own. Hello, I am new to your blog, I found you at the Weekend Gathering. I'm following via GFC, Facebook, and Twitter. Please feel free to stop by and follow back. Thanks and Happy New Year! I hopped over from the Weekend Gathering Blog Hop. I'm following you via GFC. I tried my first one this morning. So convenient to just be able to throw them in wash!